Artillery is a military combat arm. The human race developed and employed several assortments of tools or instruments, apparatus, machine, and later a system or systems, which they could use as weapons for the discharge of in the ancient times rocks and larger stones, later cannon balls, recently projectiles or rockets in combat as a major contribution of fire power right in the neck of an enemy military armed force. In general, artillery provides that tremendous fire power which was applied (harmonized with the other arms) to inflict casualties on the enemy, causing physical damage, weakening the enemy forces, or terrorizing them mentally. Over the course of military history the projectiles were manufactured from a wide variety of materials, made in a wide variety of shapes, and used different ways to defeat specific types of targets. 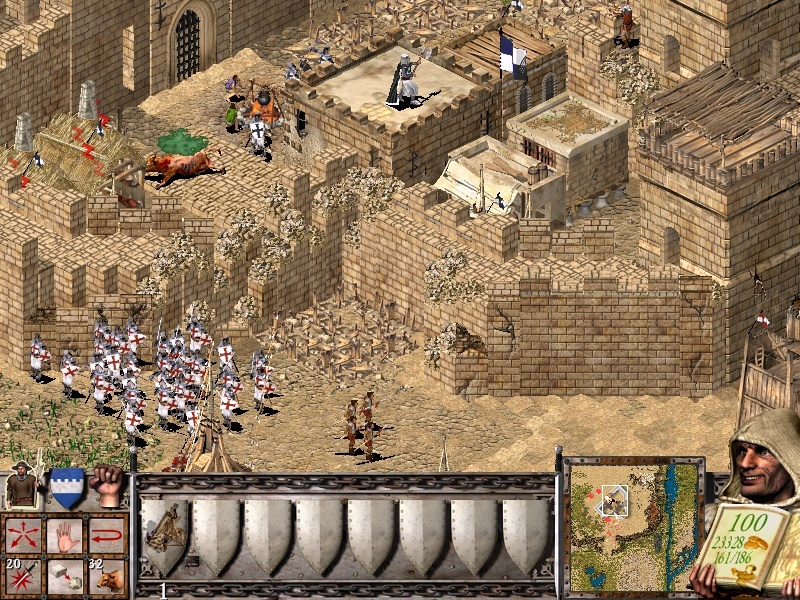 Sling, crotch, catapult, mangonel, onager, catapults, scorpion, trebuchet, and all of the ancient and medieval siege weapons, all of them were designed with the same purpose: to deliver fragments, stones and other debris, balls, and burning things into the body of the enemy, into their walls, let it be a building or a fortress, it had to be demolished, or was needed to throw thing over or above it. Why should anybody discharge something above a wall? Well, because occasionally dead bodies, carcasses of infected human corps or tainted dead animals were thrown into the besieged city, to infect and terrorize the citizens, which perhaps called as an early way of biologic or germ warfare. A Trebuchet was a perfect apparatus for this goal, and even more destructive ways, which was a more accurate artillery then a catapult. We can find good examples for all of these in the evergreen sensational Age of Empire 2 games, and in the awesome Stronghold games. In the history of the artillery during the Middle Ages and the Early modern period the artillery pieces were carried by human force dragging and pushing on the ground, later they were moved with the assistance of horses or camels. During the more recent Modern periods the artilleries were transported with wheeled or tracked vehicles, which gave more mobility, a better and quicker mode of transportation. Nowadays, the usage of the artilleries has changed significantly, they are more lethal, fire quicker and further, but the aim is still the same, sending projectiles or rockets in combat right in the neck of an enemy military forces. In the battlefield, artilleries have to support other arms, and have to to inflict casualties on the enemy with the shot projectiles. These projectiles can be casing fragments and other debris, blast, and burn injuries, or by demolition of enemy positions (such as bunkers or fortifications) and piercing of enemy armor. Science fiction has even newer and more fantastic ways for artillery destructions. 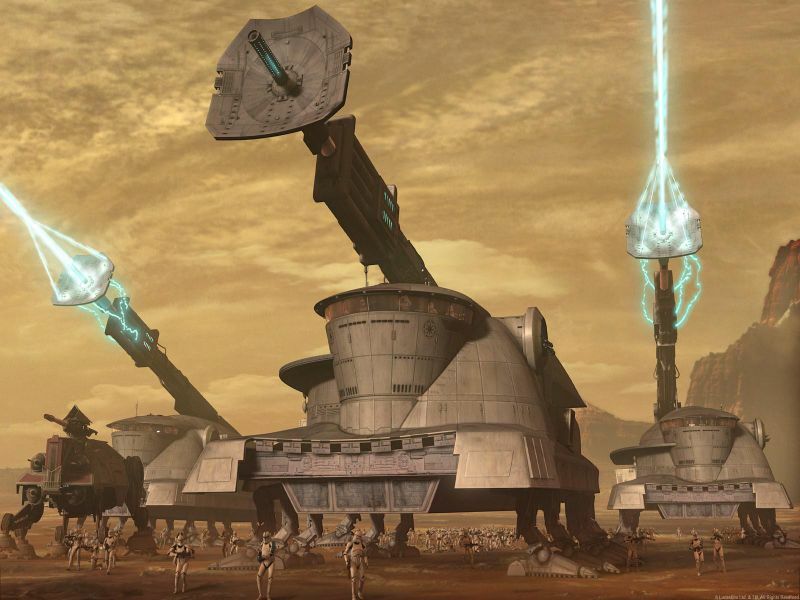 We could see some artillery examples in the world of Star Wars, too. A part of them is working the same way, as we learned in the previously mentioned methods from the real world, which means they launch some kind of projectiles towards enemy targets, which projectiles are often laserfire, some kind of bombs, (proton, plasma, etc. ), but we have seen ray and particle firing artillery equipments, such as the SPHA-T clone artillery platform, which emits a constant laser beam. 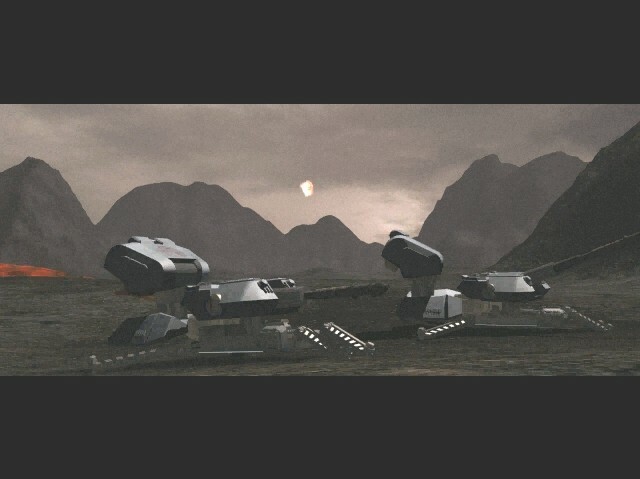 They used it against the escaping Trade Federation spaceships in the Geonosis scene in the film, and the GAR deployed special mobile artillery platforms to fight the dangerous Zillo beast in Clone Wars. 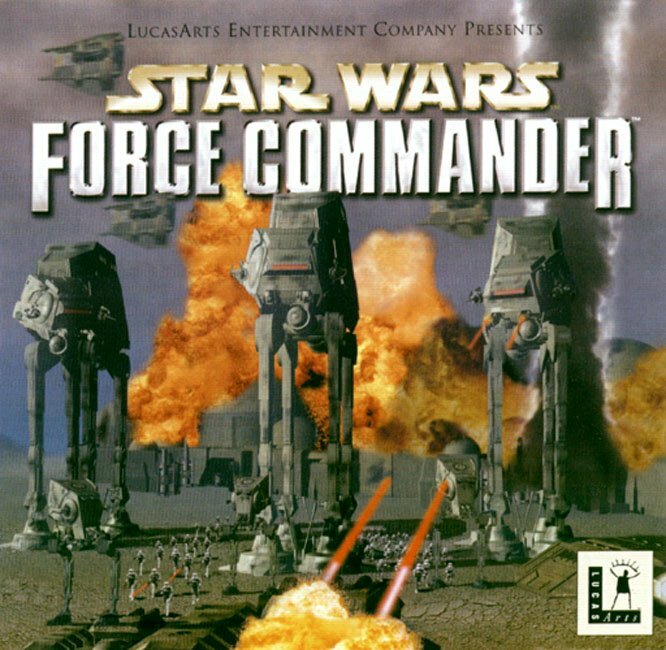 In the game Force Commander there are two different artillery types. One of them is called mobile artillery. That is a fast moving antigravitation hovering platform, which is able to quickly maneover through enemy fire on the battlefield, swiftly hovering to the best possible spot, what it needs to reach to be able to support the other arms during an imperial military operation. After it reached the designated area, the mobile artillery lands, it expands its legs, opens its armor, releases its cannon, and starts bombing hostile positions and infantry units from the safe distance. However it is not so good at piercing of Rebel armored vehicles. The main purpose of the mobile artillery is to deliver its deadly plasma munitions onto the target, to inflict casualties on the enemy with detonating plasma blasts, and burn injuries. The artillery has a fair line of sight and target distance, but if we play with fog of war, we can make benefit applying a scout, or artillery observer. 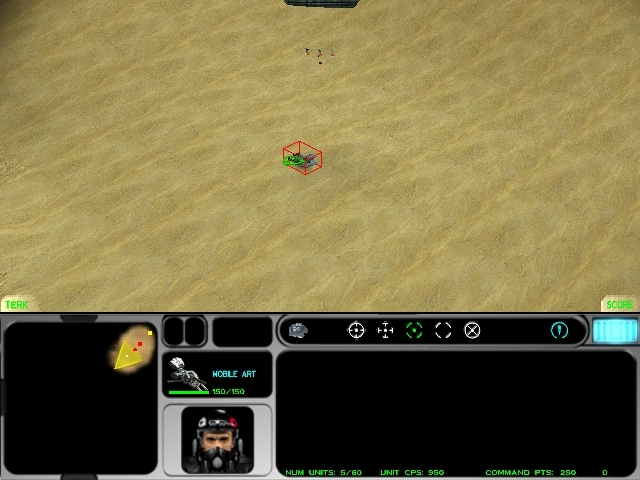 The artillery fire may be directed by a probe droid or a speeder biker scout, who has a great line of site, detecting the enemy much earlier, and much further, so transferring the reconnaissance data with a mobile artillery can help us destroy the incoming threats from a distance, earlier then they can even react. The only combat in which a mobile artillery is unable to take part in is the close quarters combat, and air defence. 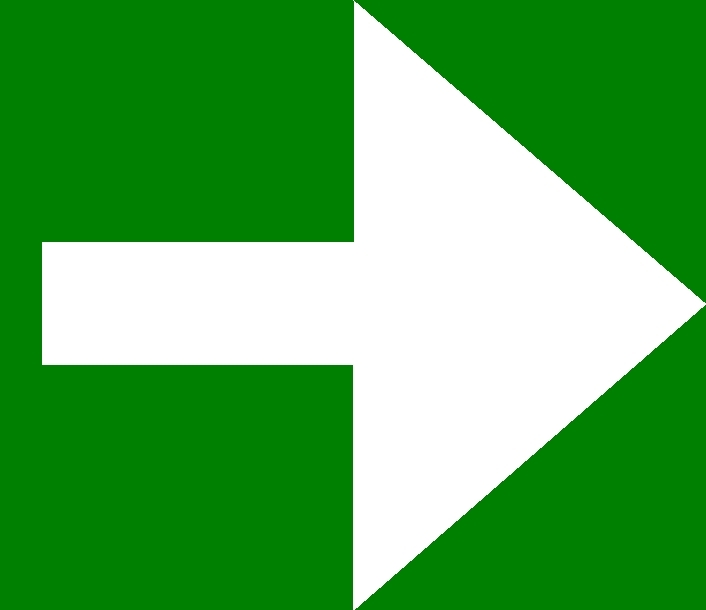 The same way, as in every strategy games, if a unit gets to close to a ranged unit, it stops firing, retreats, until it has the needed distance again to launch its projectiles, be it an arrow in Age of Empires, a plasma bolt in Galactic Battlegrounds, or a plasma blast in Force Commander. But the Mobile artillery is slower then anybody else when forced to retreat in the mentioned two games, because it has to be undeployed first, (retracting its cannon, closing its armor, pulling back its legs, and ascending in the air) before being able to move. So the best way to fight against a mobile artillery, to move within its attack range, getting to is place it will stop attacking us, trying to undeploy, and retreat. But until it prepares, we will have plenty of time to destroy it from direct close. Also, attacking artilleries from the air is a good idea, since it cannot do anything against rebel airspeeders, and bombers, which can quickly tear them apart. So defending your artillery platforms is highly recommended! 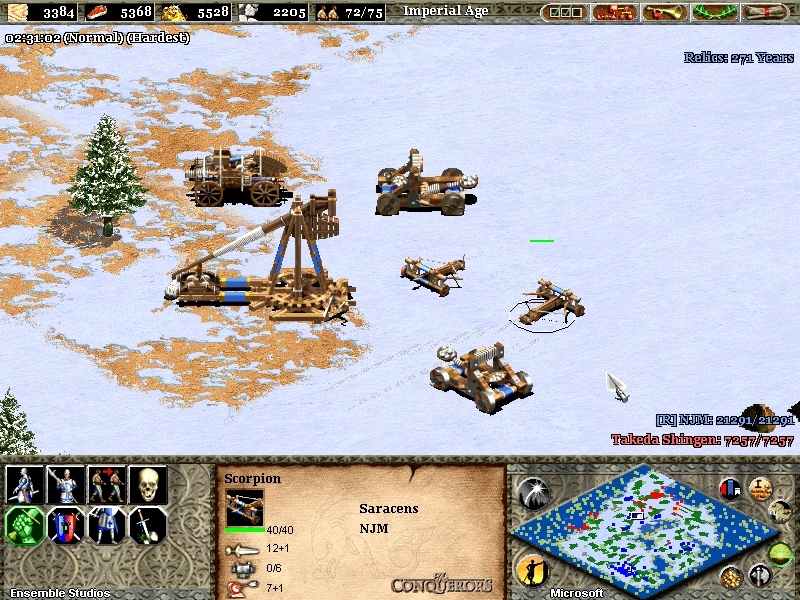 AI defends its artilleries, indeed! It has massive defences, with turrets! In this screenshot we can see, that the last walker of my stolen assault squad was attacked from the dark by some unidentified threat. So the slow AT-AA turned that way, and started to walk alone towards the aggressor. It has shorter LOS then the mobile artillery, which is bombing its prey from the cover of a mountain, so the walker cannot see it, but already getting plasma on its back. The first thing that he will notice from the dark fog, is the three defence turrets, an anti infantry, an anti vehicle, and an anti air turret. Since the other two means less threat to my walker, I use its powerful chin gun fire to the anti vehicle turret, which barely survives, so I must finish it off soon, to prevent it firing me, because they damaged my walker 240 health points already. 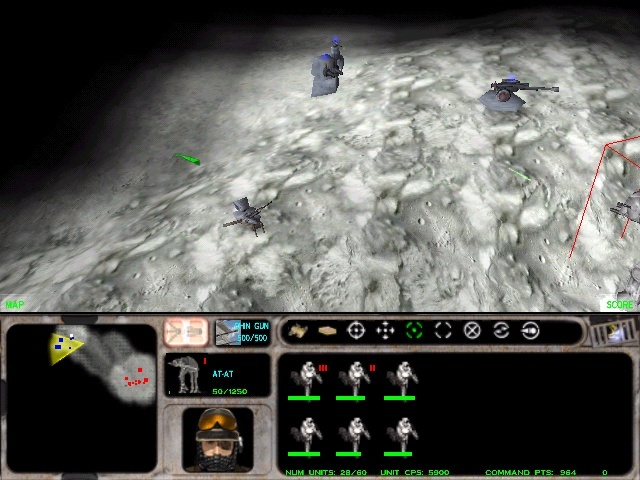 I can not occupy the turrets, I can not take advantage of my 6 troopers sitting in my walker, if I tried to unload them, the mobile artillery's splashing charges would kill all of them immediately. It is a concentric total defence, the turrets protect the artillery behind, and it protects the turrets. Without a good solution we must finish off the AV turret, then destroy the mobile artillery, after it we can occupy or destroy the remaining 2 weaker turrets. Destroying them is better if we have reinforcements in the nearby, and don't really need the defence of the turrets, since we can gain some good Command points after destroying such a turret, and also some battle experience, and I cannot even mention an easier way to give your infantry units higher ranks, than shooting a building that can not defend itself, such as the anti air (AA) turret. 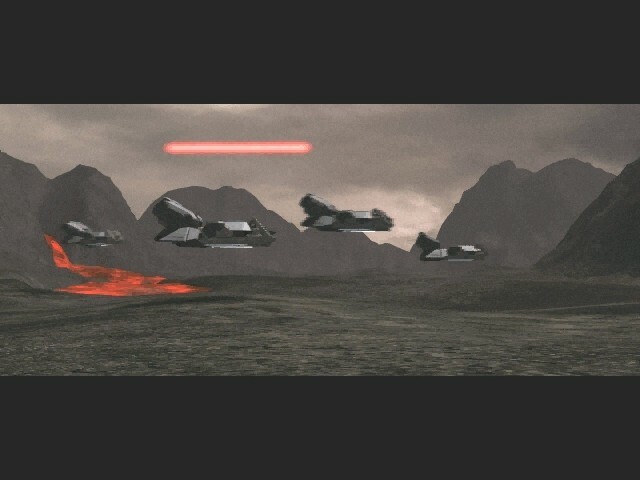 Occupying them can make you strategic advantages however, because near the taken AA turret your survivors cannot be attacked from air, and the AI turret helps them keep the enemy infantry away, so we can gather there, we can bring reinforcements here, and repair droid to repair the damaged walkers. We can continue our attack from this points, so both solutions are good from a point of view, everyone can decide, which one to choose. We can see almost the same situation in the next picture, but it is more interesting, because the mobile artillery had been deployed on the aqpex of a mountain. Well, that is impossible. For you... Just try to order a shuttle there, the morose female pilot would tell you, that was not an acceptable landing site, select an other one. (You can read more in my shuttle article.) If you choose an acceptable landing site somewhere on the ground, or in the valley, the shuttle can bring us a mobile artillery, but you cannot drive it on to the top of the hill, it can not go there! I will never understand how that little cheater AI put that artillery there. He can do that, we don't, and no reclamations. But anyway, you will have to destroy that artillery, which is not easy at all. You can get above that hill with your aircraft easily, but since the cheater AI managed to build an anti air turret on the hill too, you cannot get even close to that mobile artillery, because the AA turret would tear your fighters apart. 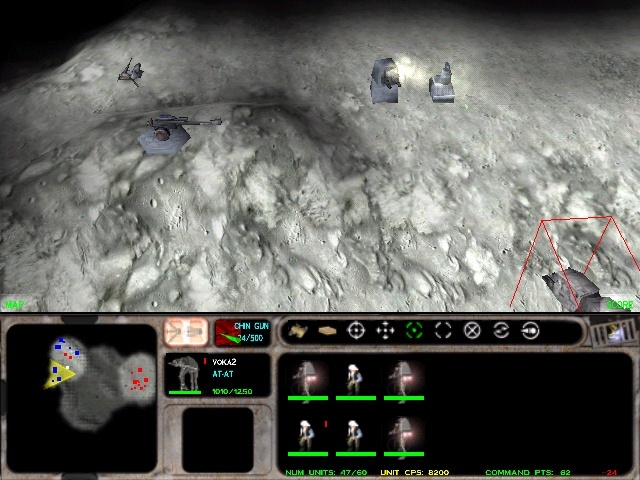 You can rush them with infantry, if you take them right in front of the turret with your walker, it will protect them, since the walker gets the plasma bombs on its back instead of the infantry, but it will cost many health points for your AT-AT. Especially if the AI and the AV turret opens fire from the other side of the hill, which are is cover, but their cannons can see above the hill, in order to damage our walkers. You cannot turn back in this narrows, and if you are able to turn back somehow, you won't get to far with the slow AT-AT, it will be destroyed soon in that enemy fire. It is a big trap, typical "load last" category, we are going to come back with a stronger squad next time, when we won't approach them just in order to take some screenshot for the CustomStarWars articles, but to eliminate the enemy presence here. We mentioned a trap previously, so here is an other typical mobile artillery trap, we are surrounded in this cauldron! If the mobile artillery is not deployed, it can not fire, so it can stay unnoticed. I have been at this area, so I knew about this trap, but I walked into it for the sake of the readers! :-) There are 4 mobile artilleries, one in every side of this area, undeployed, heavy guarded by AV, AI and AA turrets, and some extra AT-AA walkers. 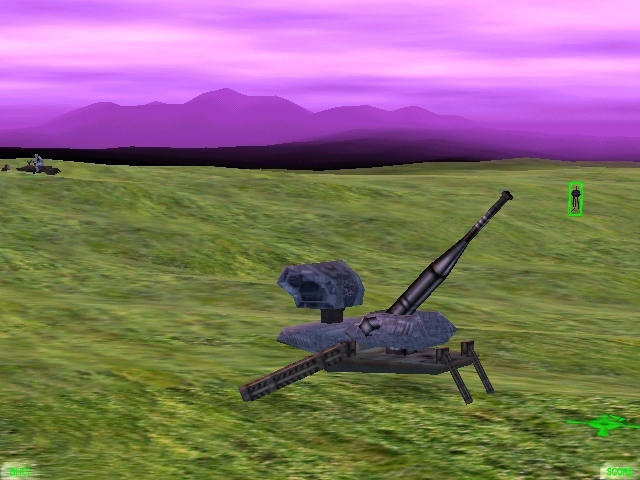 When the gamer unseeingly walks into this trap, everything start moving around him, the mobile artilleries open themselves, and start firing, and also the turrets. There is no way out, just stay focused, and try to cause the biggest possible damage amongst the enemy structures, concentrate your fire on a single object, so only that would be demolished, there is not much time left, and your whole squad would be perished. 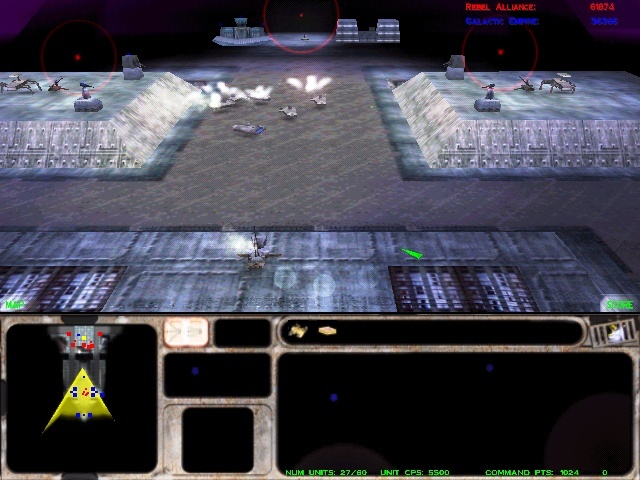 :-) If you have proton tanks around, take the advantage, that the area is light, (when an enemy attacks, the fog of war disappears, it can be seen in the map, and can be targeted by ranged units) so send your proton torpedos towards them quickly, because if your Hover tanks disappear, it will be dark here again! The outfit of the mobile artillery pilots reflects that they are a military arm, such pilots, who were trained in the ways of the artillery warfare, too. They were a black pilot uniform, and on their head there is a pilot helmet, which is open at the face area. Under the helmet there is very possibly a mask, which leads the oxygen to the pilot from the life support equipment, which is strapped on their chest. The communication ear panel, the microphone grill at the mouth, and the blow hole at the forehead is painted grey. There are a white and a red imperial signs on the two sides of the blow hole. 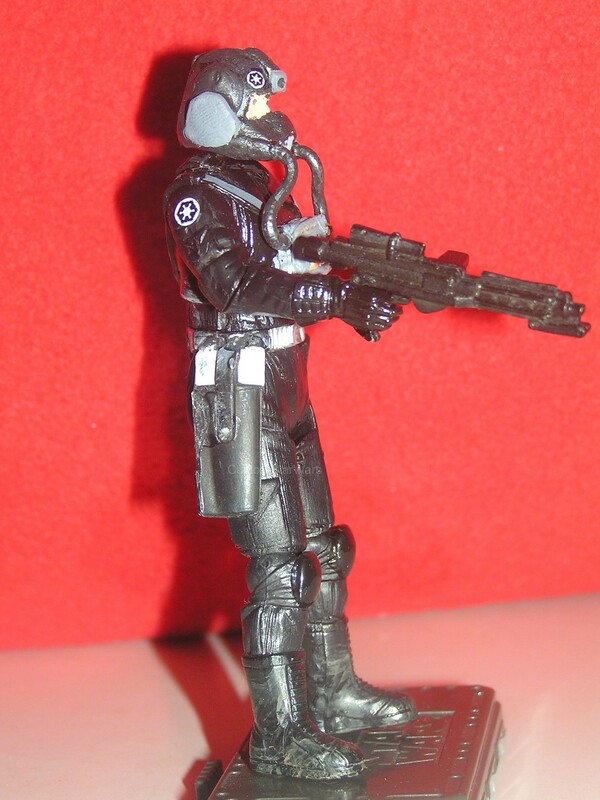 The soldier has an imperial E-11 blaster, in case of emergency. 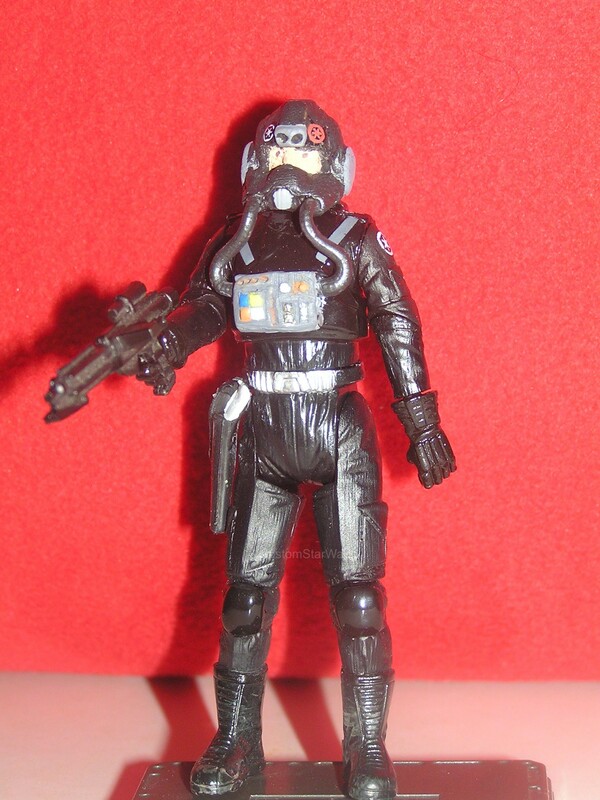 Please take a look at my Custom mobile artillery pilot figure.